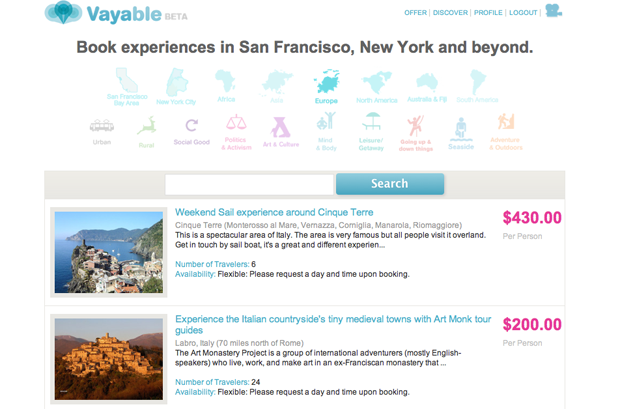 Like an Airbnb for travel experiences, secondary market place Vayable launches today to offer travelers the opportunity to buy experiences in exotic locales all over the world, from Rome to Rio as the well worn cliche goes. Founders Jamie Wong and Samrat Jeyaprakash tell me that the key difference between Vayable and that other “Airbnb for experiences” Skyara is that Vayable is targeting travelers specifically, especially those who are tired of the relative banality of activity offerings from travel sites like Orbitz and Expedia. Wong and Samrat actually met on Airbnb themselves and were roommates for about two weeks when they came up with the idea for Vayable, attempting to provide a solution to the “what do I do once I get there?” travel problem. 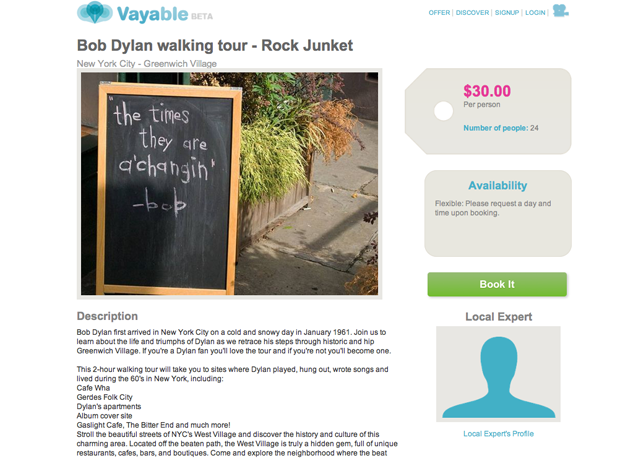 The service currently has a modest 200 users, but there are still plenty of interesting things to do on Vayable, including a taking Bob Dylan Walking Tour in NYC, joining a local king on a fishing trip in Fiji or indulging in a weekend sailing experience around Cinque Terre in Italy. “Travel has seen tremendous innovation in flight and accommodation booking, especially with sites such as Hipmunk and Airbnb disrupting the industry. But once their reservations are booked, travelers still rely on old-school (and costly) guidebooks, travel agents and online forums to plan their itineraries. It’s the blind spot of the travel industry,” Jeyaprakash explains. The site currently has 70 listings and while the offerings are admittedly sparse, activities like Textile design in a sustainable village and a trek through Singalila in India are unique and inspirational enough to become the focal point of trips yet to be planned. Vayable monetizes by taking a 15% commission from those offering experiences (which you can sign up to provide on the site if you’re a “local expert”) and a 3% from travelers. It also plans on eventual affiliate partnerships with companies who offer accommodations and flight services, eh hem Hipmunk and Airbnb. Vayable’s grander vision is to become the go-to spot for curated “hi-res” travel experiences, “If a model like ours isn’t implemented, there will be nothing but visits to Starbucks and McDonalds [available for travelers] in 10 years,” Jeyaprakash tells me, exaggerating slightly.